“We have to be the party of everybody, or we’re the party of nobody.” That’s what Tom Watson said in his 2015 conference address. The deputy Labour leader’s statement is surely pertinent to the dedicated, hard-working staff who serve our party and work long hours every week towards our collective pursuit of a Labour government. A huge amount is expected from us. We work long hours. We organised the showcase seen last month in Liverpool. Our party staffers are the most loyal and dedicated group of individuals I have had the great pleasure to know. But it may surprise you to learn that some of us are living in difficult financial circumstances. I know of colleagues who have used payday lenders, I know of colleagues who have been to food banks and I know of colleagues who are now in long-term debt. These are staffers who are employed as on as little as 12 hours a week and don’t know how many hours they will work next week. These are colleagues who have contracts lasting as little as two months, outside of election time, and these are colleagues who have families and children to support. That isn’t working to live – that’s working to survive. Yes, this is reality for thousands of working families up and down the country but it should not be the reality for our own staff, the bedrock of our movement. 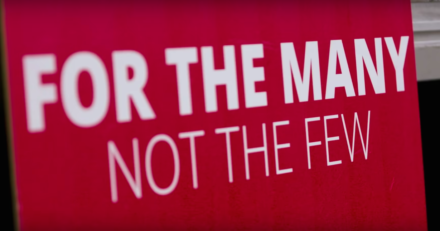 The Labour Party now has over half a million members, united in our desire to defeat the Tories. It is the collective duty of each and every one of us to hold the party to the highest standards. That is the job of Jeremy. That is the job of Tom. That is the job of the PLP and our elected representatives. That is the job of trade unions. That is the job of everyone who attended party conference. That is the job of everyone with a party membership card. That is the job of all of us. These are the individuals who will answer the phone when you call us, respond to your emails, write to you and face the most intolerable vicious abuse from members of our own party. My call to the Labour movement is this: stand shoulder-to-shoulder with party staff and ask Jennie Formby to get round the negotiating table with us. We call for the end to the fictitious nature of many employment contracts within the party. It is unacceptable for those on short-hours contracts to find out that they are needed with only a few hours notice to spare. This isn’t Sports Direct. These are our brothers and sisters, and they have families and kids to pay for. Party staffers are relying on tax credits to make ends meet while fighting tirelessly for a Labour government for the many. Our employment is insecure, but we believe workers should have the right to contracted hours that match the hours we regularly work. Theresa May has never won a majority, and our task now – as a strong, confident and united Labour Party – is to make sure she never does. We owe it to our colleagues to call for better, and we owe it to them to call for action now. If you feel strongly, please write to Jennie Formby urging her to meet with trade union colleagues to demand an end to these insecure practices, and ensure our organisation is fit to deliver for the many, not the few. The author of this article works for the Labour Party in its National Communications Centre in Newcastle and wishes to remain anonymous.